I should probably start by acknowledging that the above title is a little misleading, since strictly speaking the recipe I bring to you here is for a cake that can be made (and enjoyed) at pretty much any time of year, and is not just limited to those waning days of summer such as we’re experiencing now. 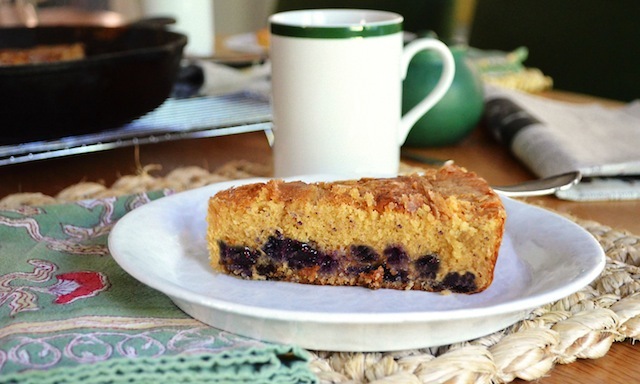 Still, there’s something about the simple, celebratory quality of this cake that makes it particularly well-suited for these early weeks of September—an ideal send off for all those locally grown, sun ripened blueberries sitting in the fridge, and a warming welcome for the cool mornings that are just around the corner. That was my feeling, anyway, as my niece, Isabel, and I set about assembling the cake for a family dinner at my parents’ place in Maine several weeks back. It’s worth noting that at the time I had no intention of posting the recipe here, as it had already been featured on a number of blogs (most recently on Tim Mazurek’s excellent site, Lottie and Doof ), and I couldn’t imagine there would be much more to add to the conversation. I changed my mind, however, for one simple reason: this cake is too good not to share with all of you as well. And, of course, I ended up tweaking the original recipe slightly, so if nothing else you can consider this my five-cents addition to the dialogue. 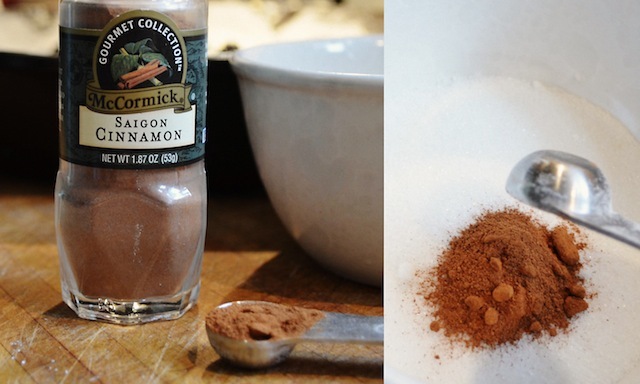 But that seems to be thing about this recipe: people keep stumbling upon it, giving it a whirl, then feeling the need to spread the word (sort of like a chain letter, but with none of the foreboding if you choose to ignore it, and the simple promise of something good to eat if you don’t). The recipe was given its latest set of legs by the cooking show America’s Test Kitchen, who picked it up from their sister publication, Cook’s Country. Prior to that, one can assume at least a modicum of fame for the recipe following its selection as a Pillsbury bake-off winner—the timing of which I’m not exactly certain, but based on its original moniker of “Blueberry Boy Bait” (so-called because of its alleged success with teenage boys), I’d wager occurred sometime during the 1950s. 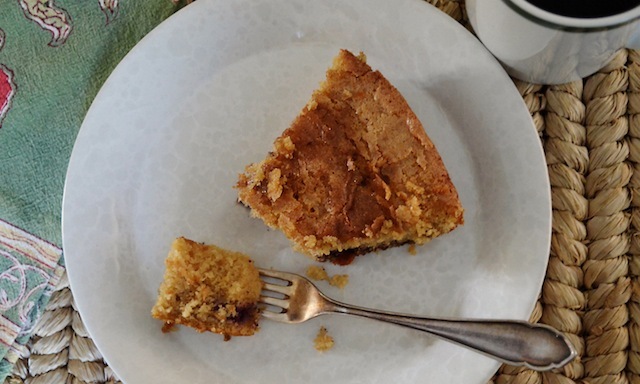 Still, one of the winningest qualities about this cake is the fact that it’s not explosively sweet—it’s coffee cake or muffin sweet, but a long way from the cloying sugary-ness of many fruit-based desserts. Together with its low-lying, compact nature (this is the kind of cake you want to hold in your hand, bypassing a plate and fork altogether), it’s a characteristic that makes for an ideal breakfast treat or simple dessert, when you’re looking for a homey, gratifying reward and don’t feel like blowing the doors off with something more high impact. Which is not to say that this is a sugar-free experience—far from it. In fact, a standout pleasure of this cake is its lace-y, caramelized topping, one that comes courtesy of that age-old duo, cinnamon and sugar. Here the pairing offers a seductive hit of sweetness, while also providing a bit of crunch that proves the perfect foil to the moist, tight crumb of the cake’s interior. 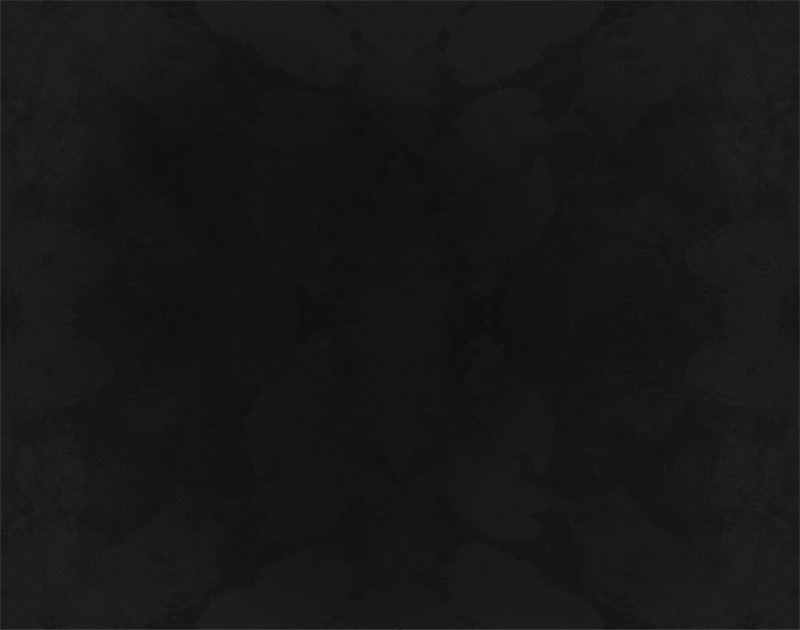 But one can’t underestimate the appeal of another of this recipe’s standout features: its ease. It’s a quality underscored by the fact that on my initial outing with this cake, Isabel and I assembled all the ingredients and had it in the oven in little more than fifteen minutes—this despite a good deal of family traffic in and out of the kitchen, not to mention a pileup of baby bottles and other items clustered on the counters. 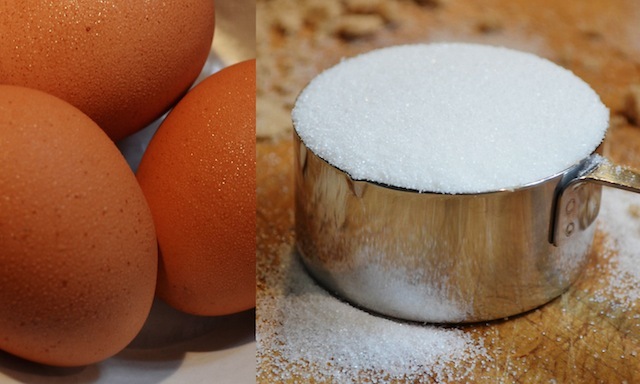 Still, it doesn’t require a lot of real estate, or focus, to take a mixer and beat a few sticks of softened butter with a quantity of sugar (both white and light brown) until it’s fluffy, then to introduce several eggs until they’ve just merged with the other ingredients. Nor is it particularly taxing to mix in a third of your dry ingredients (the flour, baking powder, and salt, previously whisked together) as you do next, followed by half of your milk, and then to repeat the sequence so that you end this phase of the cake’s assembly the same way you started it—with a third of the dry ingredients. 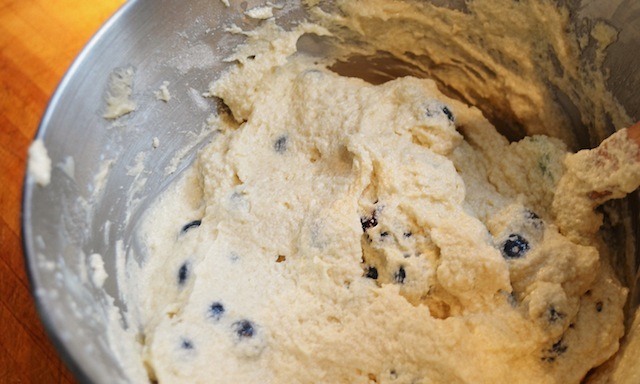 And then there’s the addition of the 1/2 cup of blueberries—tossed with a tablespoon of flour to keep them from sinking to the bottom, and gently folded into the batter. Easy stuff. 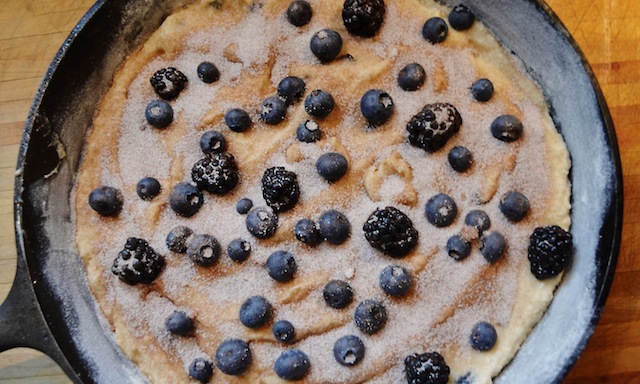 All that remains is to spread the batter into a greased and buttered baking dish (13 by 9-inches, if you’re following the ATK recipe to the letter), scattering the remaining 1/2 cup of blueberries across the top, and sprinkling with the aforementioned cinnamon and sugar. Slip the pan into a preheated 350 degree oven for 50 minutes or so, and you’re good to go. Of course, as discussed above, I made a few small changes to the recipe, some of which you will likely already have noticed from the accompanying photos presented here. The first and most significant is that rather than baking the cake in the pan prescribed by the recipe, Isabel and I decided to go out on a limb and bake the cake in a 10-inch cast iron skillet instead. 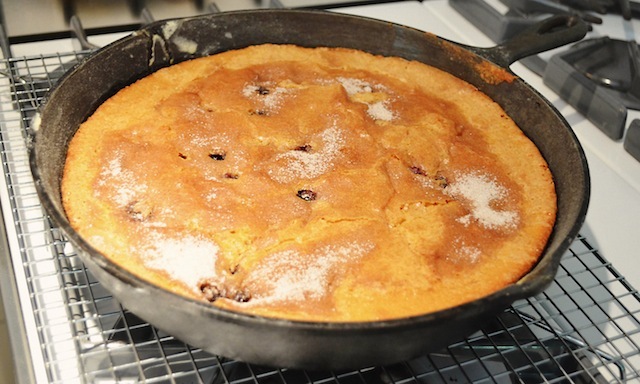 The decision was a relatively simple one, as the only pan in my parents’ kitchen approximating the requested size was already in use, but it also proved a fortuitous one as the rustic quality of the skillet proved a perfect match for the cake’s fuss-free, homespun quality. 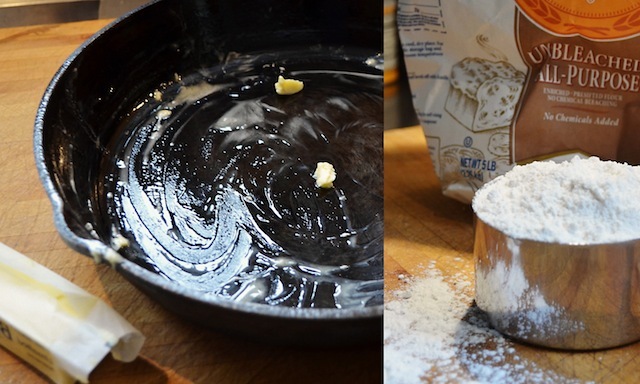 What’s more, it allows you to skip the recipe’s final step of turning the cake out onto a serving platter, as one of the pleasures of a cast iron skillet (at least for me) is the ability to serve directly from it, something I especially like to do with anything baked. And a few other tweaks, some not entirely successful: One involved the quantity of berries called for by the recipe, a measurement Isabel and I thought could stand to be increased. Since we were working with local Maine blueberries, which are about a fourth the size (and weight) of the sort you find in most other parts of the country, our decision to increase the number used in the batter by an additional 1/4 cup was a good one (in fact, in our post-game analysis we determined we could have added even more, doubling the number from a 1/2 cup to a whole). But when I tried the same ratio at home using the standard sized berries I’d sourced at the farmer’s market, they proved too heavy for the batter and once out of the oven, ended up lining the bottom of my pan. 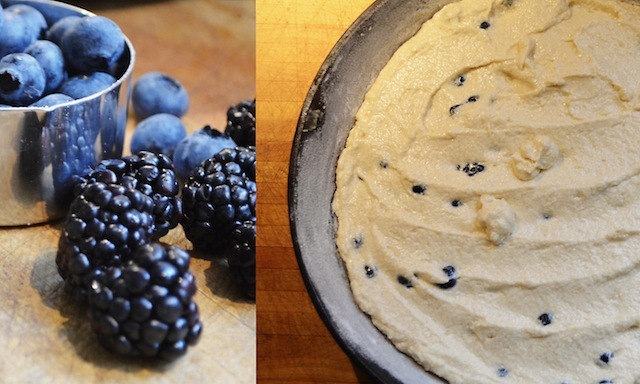 And I ran into a similar problem when, a few weeks later, I decided to add some leftover blackberries into the mix. So unless you’re working with very small berries, it’s best to keep the measurements as listed below. Either way this simple dessert cake is a surefire crowd-pleaser, no matter what time of day—or year—you decide to make it. Don’t believe me? Just watch the line form. 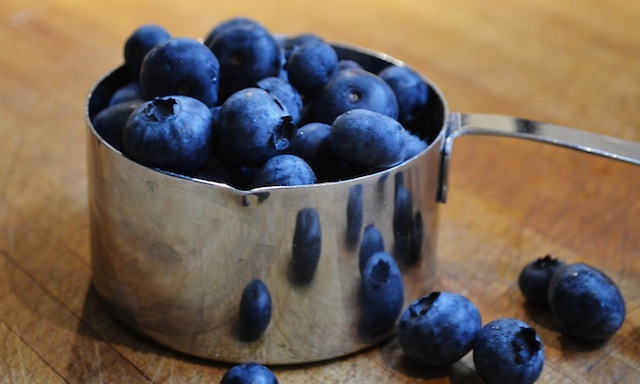 NOTE: If using frozen blueberries, do not let them thaw, as they will turn the batter a blue-green color. —Adjust oven rake to middle position and heat oven to 350˚. Grease and flour a 13” by 9” baking pan (or a 10” cast-iron skillet). 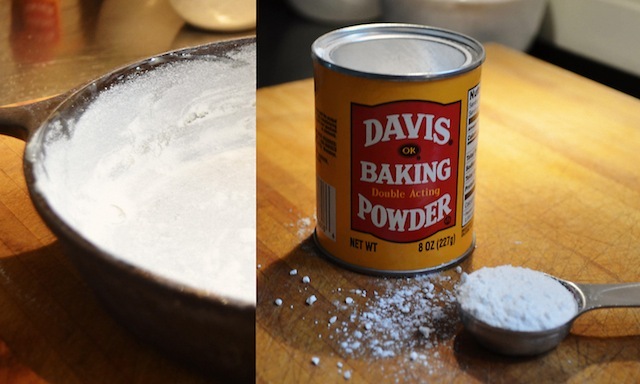 —Whisk 2 cups flour, baking powder, and salt together in a medium bowl. 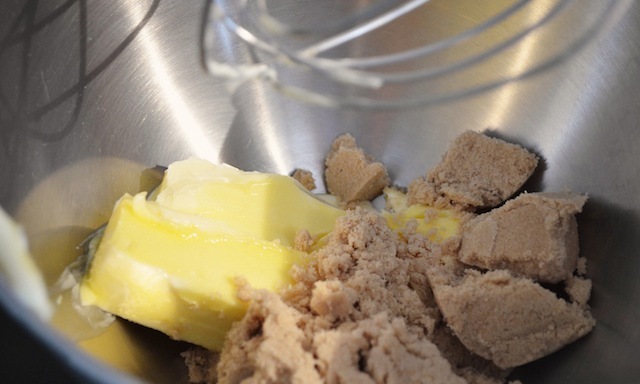 With electric mixer, beat butter and sugars on medium-high speed until fluffy, about 2 minutes. Add eggs, one at a time, beating until just incorporated. 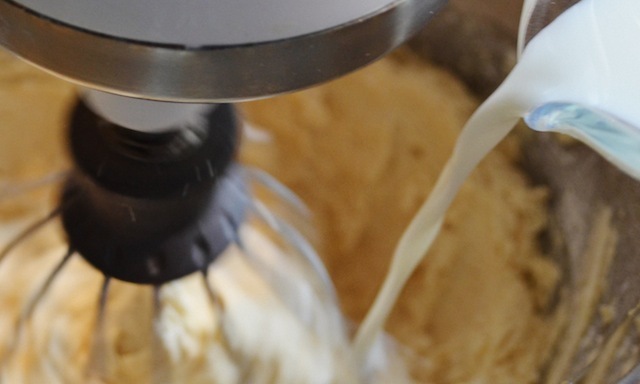 Reduce speed to medium and beat in one-third of flour mixture until incorporated; beat in half of milk. Beat in half of remaining flour mixture, then remaining milk, and finally remaining flour mixture. 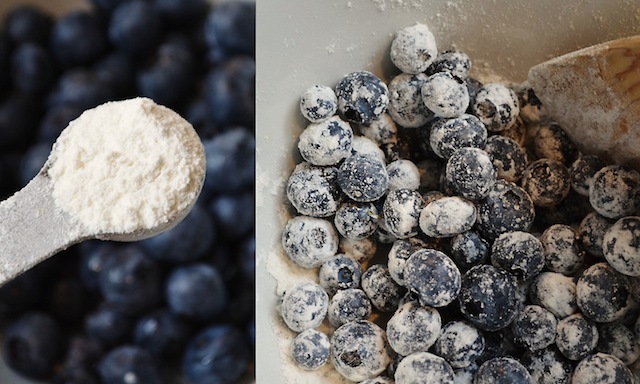 Toss blueberries with remaining teaspoon flour. Using rubber spatula, gently fold in blueberries. Spread batter into prepared pan. I simply adore this cake! I am making it for the second time in a week and a half. It is great for almost anyone; not to fancy for people with simpler palates, but not to simple for those with complex tastes.